A member of “The Muses"
Teach: Award winning pianists in advanced literature, composer, lead ensemble vocal groups and bands in the Asheville area. Judy’s driving passion is to be actively involved in preserving Appalachian heritage through music and stories. She is available as an entertainer singing Appalachian ballads and telling mountain tales. She performs in the women's group, "The Muses," singing "Celtic Hillbilly Soul," has toured with Sheila Kay Adams, and teaches others to be performers. She has a BM in Piano Performance from Converse College and a Master of Arts in Liberal Studies from ETSU, main focus Appalachian studies with a special emphasis in ballad singing. “I would also very much like to be a part of influencing the Asheville Area in the preservation of mountain culture,” she says. Shawn Crowe, is a enrolled member of the Eastern Band of Cherokee. He has worked in the broadcasting industry for the past 32 years as a voice talent, producer and engineer. Most recently he is the color analyst for 570 WWNC's Buncombe County Game of the Week which is produced in Asheville. He is also the media instructor for the Cherokee Youth Center Boys and Girls Club's Cherokee Youth in Media program which has produced may projects such as the radio play Why Possums Tail is Bare, Bullfrog Lover, Cherokee One Feather News, and Thirteen Moons an audio book which was recorded in Cherokee by Myrtle Driver Johnson. Shawn is married to Sebrina Crowe and they have three beautiful children, Taelynn 13, Natalie 8, and Ryan 7. They live in the Wolfetown Community on Wright's Creek. Shawn is very active in helping to preserve the Cherokee language by utilizing his talents and opening his studio to the Kituwah Preservation and Education Program in helping with the recording of the many projects that are used by the academy . An avid reader and bibliophile he collects all types of books but is most proud of his Native American book collection. He is proud to be Cherokee and is trying to help break the stereotype of Native People by sharing the true history and culture of the Cherokee People. Although Neal is trained in electrical engineering, business and computer science, his love is in the creative arts. Neal is the secret behind the professionalism of Stories of mountain Folk. His ability to hear each segment as it should be makes the fabric of our show seamless. To check out his glass boxes go to www.boxesbyneal.com. Teach: Creative Writing every 2nd Saturday of each month in her home in Sylva. Teach: Workshops in Pastel Painting1st Saturday of each month at Nature’s Home in Tuckasegee. Parents: Joe, born in Webster in Jackson County and Kate, born on Ellijay in Macon County School: Webster School, Pfeiffer University, University of North Carolina-Chapel Hill, University of Oregan Work: School teacher, Gaithersburg, Maryland: English, history, journalism, drama, creative writing, etc. 30 years Retired to Webster where we built our house on the property of the original Jackson County Courthouse,and Georgetown, Kentucky, the home of my wife Flossie Stephens. Mary Sue taught mathematics at Sun Valley and coached cheerleading for twenty-four years. During that time she received the state superintendent's award of excellence for establishing the Union County Math Meet. 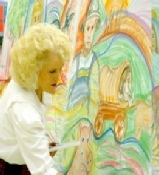 The faculty named her teacher of the year in 1983. Returning to Sylva in 1998, Mary Sue reestablished her membership at Liberty Baptist Church. At Liberty, she is assistant treasurer, Women's Day chairperson, and a member of the Budget Committee. She has been chairperson of the Waynesville Missionary Baptist Association Banquet Committee since its inception in 2001. Mary Sue's community involvement includes membership in the Order of the Eastern Star- Sylva Chapter 416B, serving as President of Bridges to Community and serving on the Boards of Directors for the North Carolina Cheerleading Coaches Association, One Dozen Who Care, Inc., and Samaritan Health Clinics. Mary Sue taught math at Smoky Mountain High in Sylva, NC where she was elected Teacher of the Year in 2000.